First off, THANK YOU for all you do! These Teacher Tips are also included in the back of the School Edition of The Gender Wheel or download as a PDF. 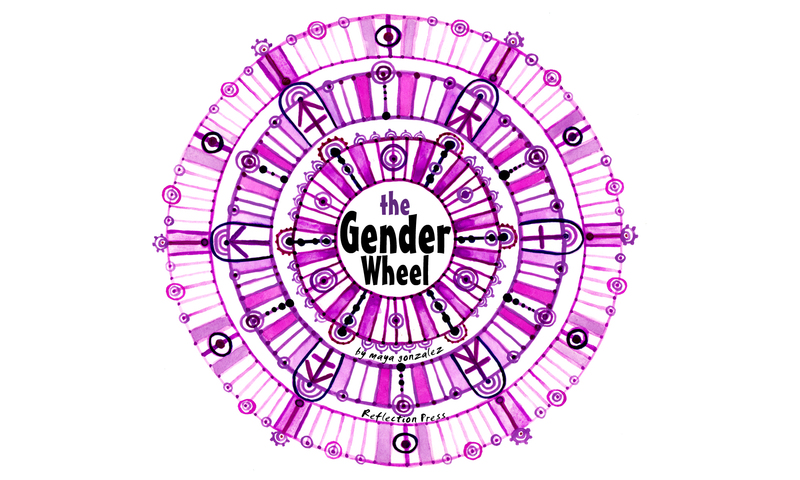 The Gender Wheel rises from a holistic, nature-based, non-western frame. Begin with the Familiar. We begin by using the familiar “boy” “girl” terms. Due to the prevalence of the boy/girl binary using them as a base to expand from provides kids with the idea that they can change what is, including their thoughts, environment and the limitations of the current culture. Community over Isolation. The Gender Wheel is based on seeing ourselves shoulder to shoulder with everyone else at the same time. We can only see that we are all connected and everyone is necessary when we see all of us together. Holistic Context. By focusing on larger and interconnected contexts, the truth of the present becomes clearer. This includes understanding when ideas about “boy” and “girl” were introduced to the Americas and why. When we look at the Indigenous cultures prior to colonization, it’s clear that ideas about 3rd and 4th genders are not new. Think Differently. The Gender Wheel encourages us to move away from thinking in opposites and explore thinking in terms of the whole picture. Black and white thinking or oppositional thinking directly supports the binary. Interrupt Falsehoods. The cover of The Gender Wheel and my other book, When a Bully is President: Truth and Creativity for Oppressive Times, are intentionally similar. Queer/trans/intersex oppression is intrinsically tied to racial and ethnic oppression. The first part of When a Bully is President explores the early development of the US and colonization. When we begin to understand the development of our country, we can better understand where many of the cultural standards and stereotypes come from and stop perpetuating them. Educate Toward Truth. Nature, Indigenous History in the Americas, US History and Global Cultures provide expanded gender perspectives beyond limited current cultural standards. Questioning why the truth about gender in these areas has been suppressed may be just as important as learning more about each subject. My 5 Part Gender Series explores these areas and more. Also included are tips for practical application, book recommendations, videos, coloring pages and more. Learn more about The Gender Wheel. Visit the website for an even more in-depth holistic understanding of the Gender Wheel.